In New Jersey, one in five residents is over the age of 65. The Garden State's legal and healthcare systems are becoming increasingly complex, making it more difficult than ever for seniors to understand their rights and take advantage of available assistance and services. 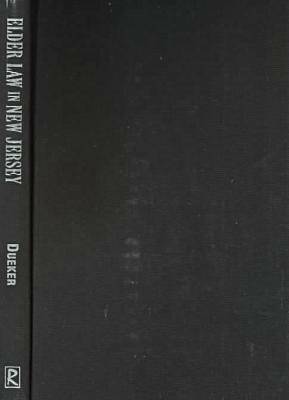 "Elder Law in New Jersey" provides important, practical information to New Jersey residents, especially older adults who have become entangled in an incomprehensible web of healthcare and social security bureaucracies, younger adults who are caregivers to elderly parents, and middle-class citizens who fear the debilitating physical and financial effects of chronic illness. The legal problems most often encountered by seniors can involve frustrating losses of control over nearly all aspects of their lives. Attorney Alice Dueker, who specializes in elder law, explains complex legal issues in easily understood language. She looks at: - various ways to obtain and pay for healthcare, including nursing home care- how to create a will- how to address and avoid internal family disputes, including child custody, marriage, divorce, grandparent visitation rights, and elder abuse- employment issues such as age and disability discrimination, as well as pensions- problems of consumer fraud- housing issues for both tenants and homeownersShe provides contact information for agencies and programs that provide free or low cost services for seniors, and resources for locating attorneys.Elder law is state specific, so New Jersey residents will find this book especially helpful and applicable to their own lives.